Twenty-two Class 55 "Deltics" were built by English Electric in 1961-62 to operate express passenger services on the East Coast Main Line from London King's Cross to Edinburgh. These 100mph locomotives were powered by two 1650hp Napier 'deltic' engines, and at 3300hp were the most powerful diesel locomotives in the British Rail fleet. Eight of the Deltics were based at Haymarket depot (64B), the others shared between Finsbury Park (34G), London and Gateshead (52A), on Tyneside. All were named; the Gateshead and Haymarket locos were named after regiments of the British Army, while the Finsbury Park locos were named after winning racehorses, following an LNER tradition. From May 1979, the new timetable introduced HSTs on to all daytime King's Cross - Scotland services and Deltics found themselves reduced to semi-fast services between London and York and Hull, whilst continuing on the overnight sleeper services. At this time the Haymarket and Gateshead based Deltics were transferred to York. However, this period did see regular use north of Edinburgh to Aberdeen for the first time. January 1980 saw the first Deltics condemned, although most of the class lasted until December 1981. 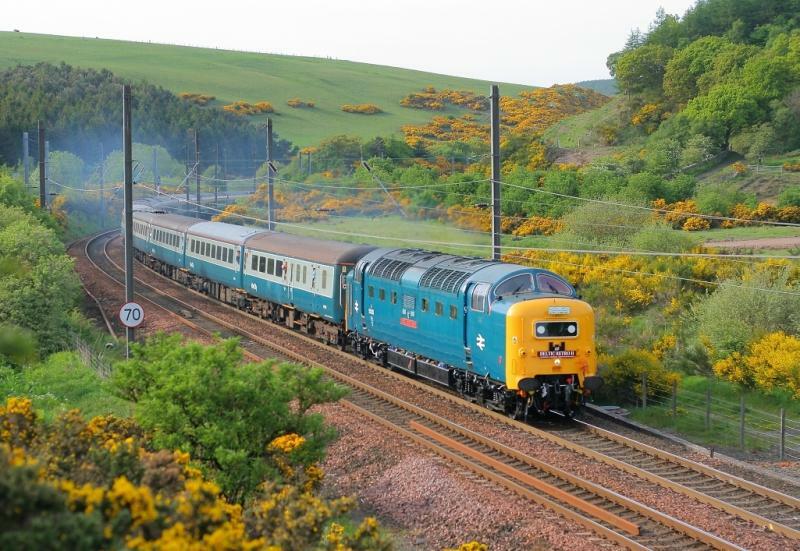 The most remarkable workings of the last full year saw 55021 used twice on Edinburgh to Oban 'Merrymaker' excursions formed of E&G push-pull stock. This operated on Sundays 2nd and 23rd of August, 1981. The last use of a Deltic on a BR timetabled train was on 31 December 1981, when 55019 worked the 16:30 Aberdeen - York south from Edinburgh. The final British Rail workings were for the Deltic Scotsman Farewell tour on 2nd January 1982. 55015 worked the 08:30 King's Cross - Edinburgh, and 55022 hauled the return leg, 14:30 Edinburgh - King's Cross. 55015 had gone to Haymarket depot to refuel, and later worked south light engine to York, following behind the 17:18 Edinburgh - Newcastle. D9000 was brought from Old Oak Common Depot to Glasgow Works on 08 August 1996, to prepare it for a return to main line use. 55019 The Silver Jubilee (DPS) Edinburgh - Kings Cross (Suburban Line, Carlisle, Tyne Valley, ECML) 55019 to Peterborough. Created by Dysgraphyk and last modified by him at 22:25, 19 of April 2015.